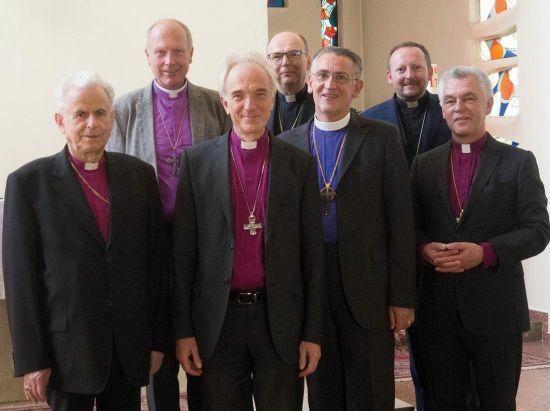 The International Bishops' Conference, founded in 1889 by the union of the Old Catholic bishops of the Netherlands, Germany and Switzerland is the linking organ of the Union of Utrecht. The Archbishop of Utrecht is the President of the IBC and chairs the meetings. The Bishops of the member churches meet yearly in a general assembly to deal with current business. As the Union of Utrecht is not a legislating body, but a free association of independent Old Catholic churches, the Bishops' Conference has no jurisdictional competence in the individual local churches. That means, it cannot interfere in internal affairs of the local churches or make decisions that are not accepted by the local churches. A detailed description of all the tasks of the IBC can be found in the Order of the Statute of the IBC. Old Catholic Ecclesiology can concieve of neither bishops without churches or churches without bishops. Therefore the churches of the Union of Utrecht are in community with each other through their bishops. The bishops are, so to speak, the links between the IBC and their local churches. A bishop in the IBC represents his church to the other bishops in the IBC, and he represents the community of the Union of Utrecht to his church. That means that he brings to the IBC that which, from the standpoint of his church, is emerging as the subject of common Old Catholic witness to the challenges of our time and vice versa. In this way an exchange takes place that should lead to common solutions and positions within the Communion. This model depends on good communication at all levels, and therefore is more difficult to achieve in practice than in theory. It is therefore clear that the IBC alone is not responsible for the community between the Old Catholic churches. Rather each local church with its structures, the international bodies and the church media are also responsible for keeping the community intact. In principle, no one is excluded from this responsibility. All Documents, Photo's and video's of the 2014 Old Catholic congress.